BMWs are great for spirited riding or driving—and if you use that ability to visit scenic and historically interesting places, then you have an unbeatable combination. With that goal in mind, I set off in late October to find out whether Pennsylvania or West Virginia had the best Fall Colors. Along the way, I encountered no small number of historical haunted houses, just in time for Halloween. I don’t know if any of these field hospitals qualify as haunted houses, but considering the number of wounded who succumbed to their injuries here, it would not be surprising. Clockwise, from upper left, the Lightner farmhouse is now a bed & breakfast. Gettysburg Sheriff Isaac Lightner had built this home just a year before the battle. The Sheaffer farmhouse was built in 1780. The controversial Union General Daniel Sickles was brought here after being wounded on the second day of the battle; he left a day later, minus his right leg. This farmhouse is largely unchanged from Civil War days, and the floors are still marked by bloodstains from the operations performed here. The Beitler farm treated hundreds of the wounded; like the other hospital farms, it was nearly destroyed by the occupation, and the owners did not receive compensation until 15-20 years later. Lastly, the 1880 St. Mark’s Church sits where the 18th century White Church had served as a hospital and the headquarters for the Union medical brigade. Another Gettysburg landmark that I’d somehow missed is its iconic train station. It was built in 1859 for the new Gettysburg Railroad. Its tower was used for observation during the battle, but trains could not reach the station since the Confederates had destroyed a bridge across Rock Creek. Abraham Lincoln arrived at this station on November 18, 1883, en route to deliver the Gettysburg Address. Passenger service ended in 1941, and by 1996 the old station was in danger of collapse. The city completed its restoration in 2006, saving this important landmark for future generations. Gettysburg didn’t offer much in the way of Fall Colors, but I found the 1854 Sachs Covered Bridge southwest of the city, where it spans Marsh Creek. The First and Third Corps of the Union Army crossed this bridge on their way to Gettysburg, where the Confederate Army was already arriving (ironically) from the north. Following their defeat in the battle, Robert E. Lee’s forces retreated across this bridge. Sachs Bridge is one of the few remaining “Town Truss” designs in the country. It was partially swept downstream and nearly destroyed altogether in a 1996 flood but has been rebuilt using the original materials. Following the Battle of Gettysburg, the Confederate Army also needed field hospitals. One of its largest was established at the Black Horse Tavern, west of town. The tavern had been in operation since 1812; the 2-story log portion on the left in the historical photo (courtesy of Gettysburg Tour Guide John Winkleman) probably dates back to the late 1700s and was present during the Civil War. It has since disappeared. Many early travelers carved their names and the dates of their visits into the walls and woodwork of the tavern. One wounded Confederate soldier was recuperating here and was surprised to discover his parents’ names in the wood! As luck would have it, the current owner of the tavern and his son arrived to do some chores. Billy Leonard had been an airline pilot before his retirement, and he called out to his son, “Go fetch the tractor! Someone abandoned their car by the creek, and I want you to drag it up to the barn!” He was referring to my long-suffering 335i and taking advantage of a good opportunity to pull my leg. We had a fun chat before I left them to their chores. Billy lives in the old tavern and rents out the farmland to a neighbor, who continues to work the land. So far I’d been having a lot of fun on the trip, but I hadn’t seen much in the way of Fall Colors. I continued on in the general direction of Pennsylvania’s Michaux State Forest, discovering the Cashtown Inn on the original Lincoln Highway along the way. The inn started life in 1797 and acquired its name because its first proprietor would not accept anything other than cash for payment. Confederate General A.P. Hill made his headquarters here in late June 1863. The Battle of Gettysburg was triggered when he ordered Gen. Henry Heth to go into the town in pursuit of shoes for his army. A few days later, the inn’s basement and outbuildings were used to shelter wounded Confederates. Many years later (and after almost 200 years of service), the inn fell into disrepair. It was rescued by a local couple, and it is now once again a resting place for weary travelers. Oh, and it’s exceptionally haunted, naturally! Once I climbed upward toward the top of South Mountain, I immediately found Fall Colors in abundance. This is Highway 233, next to what had been the Chambersburg, PA reservoir. Where once there had been 387 million gallons of water, now only a trickle of Conococheague Creek runs through the valley. The county has thoughtfully planted numerous trees and shrubs, and in another 10 years it will be hard to spot any indication that there was once a large lake here. I had driven by Dead Woman Hollow before, but this time I was curious as to how the area got its name. As best I can tell, a woman was bitten by either a rattlesnake or copperhead here in the late 1800s and died. History does not record her name or how she came to be in the hollow. Sadly, her death was not the last; in May 1988 two women on a camping trip were shot at. Rebecca Wight died at the scene hours later, while her badly wounded partner, Claudia Brenner, walked 3 miles through the darkness for help. Brenner survived and later wrote a book about the experience. After 11 days, Stephen Roy Carr was captured; he is continuing to serve a life sentence in a Pennsylvania maximum-security prison. Whew… Continuing on, I headed for nearby Camp Michaux, which I had “discovered” a few years ago (see Z4 Touring: The Lost POW Camp). This part of the Michaux Forest was originally home to the Bunker Hill Farm, established in approximately the late 1770s. By 1931, the farm was abandoned and overgrown, and the Civilian Conservation Corps acquired it for the purpose of building a “boys’ camp” (for young men aged 18 to 25 who enlisted in the CCC). The first campers built log cabins, a dining hall, and other facilities, and it became the first CCC camp in Pennsylvania. The facility prospered through the early 1940s, when it was secretly acquired by the Army’s Military Intelligence Service and the Office of Naval Intelligence and converted for use in interrogating German prisoners of war during World War II. Local residents knew nothing of the camp’s true purpose until after the war. In the late 1940s, the area was converted to Camp Michaux, a Presbyterian/UCC church camp for young people. Now, 42 years after the camp’s final season, many artifacts remain deep within this dense stretch of woods. On my prior visit, I had missed many of the sites and was anxious to seek them out. I started by revisiting the one remaining wall of the Bunker Hill Farm’s stone barn, which is now far easier to locate than it was 4 years ago. (There’s even a parking area, for gosh sakes. Where’s the adventure in that?) The barn is said to have been built by Hessian prisoners of war, who were, uh, “farmed out” to local farmers during the American Revolution. The photo doesn’t convey the magnitude of this place: it was three stories high, and the walls are three feet thick. I was especially looking for the “old swimming hole” and the newer swimming pool built for the church campers. I had only a vague idea of where they were, since I’d neglected to bring a copy of the excellent Camp Micheaux Self-Guided Walking Tour, but I spent an enjoyable 1½ hours hiking around, exploring, getting caught in thorn bushes, tripping over stones, etc. Along the way, I found this large concrete block, shaped like the famous Pennsylvania “keystone” state symbol. It served as the entrance step to one of the CCC barracks, which was later used as the camp’s education center, then housing for guards and staff for the POW camp, and finally housing for the church camp kids. This low stone wall and steps are located nearby. There were many other remnants throughout the area, including the foundations for various buildings and guard towers, pumping station ruins, flagpole and gate anchor plates, and so forth. And I have to go back yet again, since I still missed about half of what’s out there! The CCC boys built the “upper dam” and reservoir, which supplied water to the camp. A proper swimming pool was built for the camp in 1954. It’s fed by a spring and, remarkably, the water continues to flow unimpeded into and through the pool without becoming stagnant. The diving board is long gone, although its supports are still in place. Just as well, since diving in-between several small trees growing out of the pool would be a bit of a challenge. After crashing and barging around a forest in the middle of nowhere, it’s always good to find your way back to where you parked—and to see that your BMW is still waiting patiently for you! Back on Highway 233, I continued to enjoy the Fall Colors. It’s not exactly straightforward to take a one-handed, three-exposure HDR photo while driving at 50 mph, but the result turned out just fine. Most importantly, the 335i was still shiny enough to reflect the foliage on its hood—but that was about to change. Before the swimming pool was built at Camp Michaux, the kids would often hike to one of the lakes at Pine Grove Furnace Park to swim. Fuller Lake was closer, but it was much smaller than Laurel Lake. It had been a quarry supplying iron ore for the furnace and is said to be over 90 feet deep. Between its depth and a bottom that plunges abruptly from the shore, it was never the safest place to swim. Laurel Lake supplied water to the furnace operations and today has a nice beach and gradual bottom. Oh, and on the day of my visit, Laurel Lake had some pretty nice colors. From the park, I headed for the near-legendary Ridge Road. This dirt road runs along the top of South Mountain for mile after mile, with a number of scenic overlooks. It’s in pretty good shape as dirt roads go (this being Pennsylvania, after all), but the poor BMW soon acquired a light coating of dirt-colored camouflage. South Mountain was formed from metavolcanic and quartzite rocks. Nowhere is this more evident than at the Hammond’s Rocks overlook. Although the surrounding trees were too tall to offer any distant views, the beauty of the rocks themselves more than made up for this shortcoming. Unfortunately, some of the “Fall Colors” were attributable to Antisocial Spray Paintin’ Weirdo Geeks who managed to find this area despite its remote location. Still, I very much enjoyed clambering around. I even managed to find my way back down without disturbing the hibernation of any Eastern Timber Rattlesnakes. I continued eastward and upward along Ridge Road, with the road condition deteriorating significantly. But the view of Cumberland Valley from the Spruce Run Vista made it worthwhile. It was a beautiful day, incidentally: sunny, and temperatures in the low sixties. An even better surprise was this ancient mill on the banks of the creek. I learned later that this was George Enck’s gristmill, although it had many other owners dating back to its original construction in 1745 and expansion in about 1800. This building is actually made up of two almost identical stone mills, joined in the middle by a wooden frame section. It was powered by twin water wheels, fed from a half-mile-long race that had been dug by hand. Enck’s Mill operated through the early 1940s. You never know what you’re going to find around the next corner. Speaking of which, if you decide to drive the twisting, 3½-mile road to the top of King’s Gap, you’ll suddenly encounter this massive stone mansion. It makes for quite a sight, and the view from its front porch is also pretty spectacular. King’s Gap is now one of Pennsylvania’s four environmental training centers. I’d been here once before on a motorcycle trip in 2007 (see Lost Again in Pennsylvania. At that time, I didn’t realize that the mansion is open to visitors as part of King’s Gap State Park. Even the bedrooms have great views. Even in late Fall, the gardens here were very attractive. I will leave it to the Rare and Beautiful Jody to identify these purple flowers for me. Before long I was in the dirt again, taking Furnace Hollow and Hogshead Roads back up to Ridge Road. Along the way, Buzzard’s Rock offered a nice view of the gathering clouds in the distance and hundreds of spent shotgun shells on the ground. What do they do up here, anyway?? Sometimes the best Fall Colors were on the ground, rather than up in the trees. This photo is entirely unremarkable—except for the white marks on the trees. They denote the Appalachian Trail, which crosses South Mountain. I couldn’t resist the opportunity to drive the ever-enthusiastic 335i on the trail, even if only for a short distance! Before long, I was back up in the mountaintops, following Rocky Mountain, Snowy Mountain, Stoney Mountain, and Rothrock Roads. This late in the day, the roads were deserted, save for one brave mountain biker—who looked a bit dazed and exhausted. I checked to see if he was okay (and to caution that he had 45 minutes of daylight left), but he said he was fine. At the top of the mountain above Mont Alto, I located the Valley View overlook. (This would not have turned out nearly so well if I had instead overlooked the Valley View location…) The road clung perilously to the side of the mountain, but it made for quite a setting. The view was even better from the road level, with the sun’s rays nearly parallel to the ground, lighting up the trees that lined this cut down to the valley below. It looked like a scene right out of Lord of the Rings, and this view alone would have made the entire trip worthwhile. With a final look at the sunset over Waynesboro—a Fall Color in its own right—it was time to head for home. A couple of days later, I set out to see whether West Virginia’s Fall Colors could compete with Pennsylvania’s. I arrived at Harpers Ferry early in the morning, finding this (presumably haunted) house just outside of town. I stopped by the once-famous Hilltop House for old time’s sake. I used to eat dinner here with my parents when I was growing up, and I well remember its narrow winding corridors that led back to the dining rooms. It’s been vacant since restoration plans fell apart in 2008, and it now appears headed to an inglorious end. A shame, really; it still offers the best view overlooking Harpers Ferry and the confluence of the Shenandoah and Potomac Rivers. (Interior photo courtesy of Debby Karalee’s excellent blog Abandoned in Harpers Ferry.) It’s said to be haunted, of course. I settled for less than the best view, given the direction of the rising sun—but it offered my first look at the Fall Colors of West Virginia. In 1862, Col. Jackson was back—although in the interim he had been promoted to General and earned the nickname “Stonewall.” His goal was to capture the large Union garrison stationed at Harpers Ferry, while the main Confederate force moved into Maryland (leading ultimately to the Battle of Antietam). Stonewall Jackson succeeded, capturing 12,500 Union soldiers in the process. The night before, however, about 1,400 Union cavalry troops and a regiment of free African American laborers rushed down this embankment to the Potomac River and crossed safely over a pontoon bridge into Maryland. The railroad bridge pictured above did not exist in 1862 (and the other bridges that did exist were destroyed and rebuilt repeatedly during the Civil War). It is a “working bridge,” however, carrying both CSX freight and Amtrak passengers across the Potomac. The Baltimore & Ohio Railroad originated in 1827 and was designed to connect the port at Baltimore with the Ohio River and its surrounding farms, mines, and manufacturers. The line reached Harpers Ferry in 1836 and the Ohio River at Wheeling in 1852, passing through Martinsburg, WV, Cumberland, MD, and a number of other cities along the way. If you follow the B&O tracks northwest from Harpers Ferry, they eventually lead to this 1839 depot in Duffields. It is the oldest surviving combined passenger and freight station in the United States—although “surviving” is a relative term, given the very poor condition of this historic building. The depot was privately owned and operated, with the stationmaster living in the stone portion while goods and materials were stored in the frame portion. As shown in this next photo, the interior of the stone building is rapidly approaching the “non-rescuable” stage. Longtime readers may remember my trip report ”In Pursuit of the Grey Ghost”, which described how John Mosby and his Confederate Rangers waged a campaign of harassment against the Union Army throughout the Civil War. In June 1864, Mosby’s Rangers attacked the heavily guarded Duffields Depot and captured 65 Union soldiers. Then, in October, they returned and derailed a B&O train just west of here, capturing (among others) Majors Edwin Moore and David Ruggles—who just happened to be Union paymasters carrying $173,000 in pay for Gen. Phillip Sheridan’s troops. Mosby divided the cash from the famous “Greenback Raid” among his Rangers, as allowed by the Confederate Partisan Ranger Act of 1862, but did not take a share for himself. The B&O station wasn’t the only dilapidated structure in Duffields. This undoubtedly haunted house stands just outside of town and displays a similar degree of dilapidatiosity. Note the small room under the staircase on the first floor: for the record, I saw no sign of Harry Potter. Have you ever been nosing around some abandoned area, only to get the sense that you’re being watched? It happens to me all the time—sometimes with justification. A Washington Post article recommended that Route 9 between Harpers Ferry and Berkeley Springs, WV was a great place to look for Fall Colors, and I was excited to give it a try. I’d driven this way before, and I remembered that it offered history, scenery, and many entertaining corners and elevation changes. What more could you ask for? On the off chance that my staunch Baptist friends Cathy and Kim have made it this far into the trip report, here are two—count ‘em, two!—historic Baptist churches for their viewing pleasure. The first one is the 1893 St. Paul Baptist Church, near Kearneysville, which continues to hold regular Sunday services. Only 2 miles away is the 1835 Mt. Zion Baptist Church, now used for one service a year. At first glance, Mt. Zion appears to be made of bricks, but the construction is actually from small stones, carefully chosen and placed to give a very uniform appearance. It represents a remarkable level of craftsmanship. Route 9 runs right through the old mill and manufacturing city of Martinsburg, WV, and I took this opportunity to explore parts of the town that I hadn’t previously seen. One such place was the Continental Clay Brick Plant. “Fired” bricks have been around since at least 5000 BC, and circular “beehive” kilns have been used to make them since at least 500 AD. Coal-fired beehive kilns were the most common method used in the U.S. through the 1800s and into the early 1900s. The eight such kilns at the Continental Clay facility were built in 1917, and I believe three of them are still in use—for drying sand, these days. Somehow or another, I’d never seen a beehive kiln before, so Continental Clay turned out to be a very pleasant surprise. 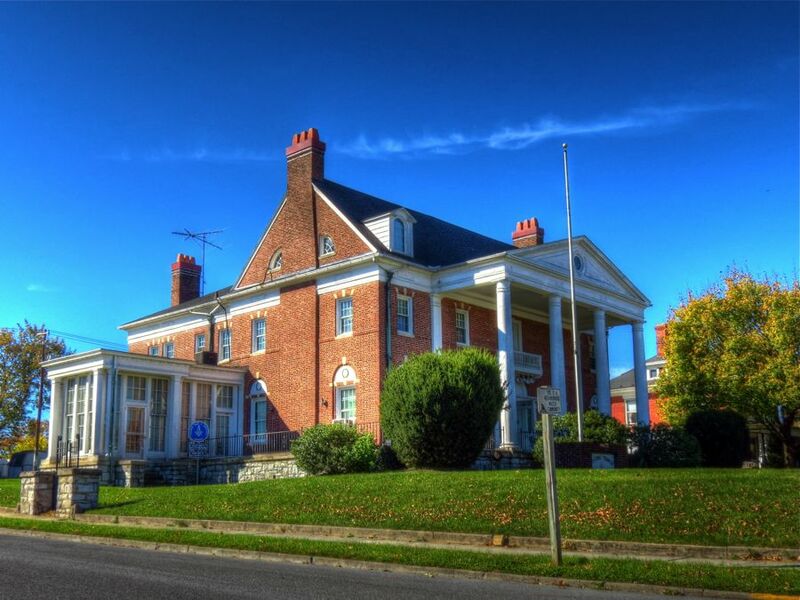 The “Boydville” section of Martinsburg has some of the most stately mansions in all of West Virginia. The area is named after the home of General Elisha Boyd, who was a commander in the War of 1812. As it turned out, it was not visible from Queen Street, and I mistakenly found the home of Representative George Meade Bowers (1863-1925) instead. It’s not quite as palatial as the Boydville mansion, but its columns came from the U.S. Treasury building, which obviously counts for something. The old courthouse / post office building in Martinsburg was constructed in 1895 and still looks impressive today. It was replaced in 1961 and converted to use as a records-storage facility for the Federal Aviation Administration. In 2001 it was given to a local organization for use as an arts center, but financial difficulties have prevented such use to date. The “Boomtown” section of Martinsburg got its name from the rapid industrial and housing development that began in the late 1800s, following the establishment of the Cumberland Valley Railroad line and the extension of the streetcar system into new neighborhoods. These buildings were part of the Crawford Woolen Mill that operated during 1891-1930. In this photo, looking south from the CVRR station, the old freight depot is on the left and several of the 1891 Kilbourne Knitting Machine Company buildings are on the right. As I looked down the tracks, I couldn’t help thinking how great it would be if a train could be added to the picture. Far in the distance, I thought I could see three lights pointing up the tracks, but there were no train horns or crossing signals to indicate that one might be coming. Zooming the faithful Canon SX40 camera out to its maximum 840mm telephoto distance, I discovered that there was, indeed, a train in the distance! Continuing along good old Route 9, I soon detoured onto Harlan Spring Road. George and Sarah Harlan were among the very first settlers in this part of Berkeley County, in the 1740s, and they probably chose this location because of its spring. The stone springhouse is in plain sight at the bottom of the hill, but the Harlans’ original log home at the top, “Spring Hill,” is largely hidden by trees. It is one of the oldest buildings in the county. Not surprisingly, the Native Americans living in this area were unhappy with the settlers. Spring Hill is said to have been attacked by Indians in the 1750s, with one of the Harlans’ younger children captured and killed on a rock directly in front of the house. Their sons Silas and James went on to serve in the American Revolution. Remarkably, the Harlan property has remained in the family to this day. Harlan Spring forms the pond in the photo above and then continues on as Harlan Run. The house in the distance is “The Willows.” The half on the right was built of stone by John Sybert in 1812, while the whitewashed brick section on the left was added in about 1850. Ownership of the Willows has also remained with the descendants of the Sybert family. Harlan Run flows northward and goes by the Falling Waters Presbyterian Church less than a mile further on. The church dates back to 1745, and its current building has graced the hills above the creek since 1834. The Harlans and many of their descendants are resting in the church’s cemetery. I haven’t said much about haunted houses lately… Dr. Allen C. Hammond built this fine brick mansion in 1838. As a Southern sympathizer in a Union-controlled area during the Civil War, he was not a popular fellow. He enlisted with the Confederates, serving as a surgeon, and his son, G. Newkirk Hammond, rode with J.E.B. Stuart’s cavalry. “Kirk” had been a star pupil of Stonewall Jackson’s at the Virginia Military Academy and had been wounded while serving with the Martinsburg Militia when they attacked John Brown and his raiders at Harpers Ferry. In the Civil War, both Kirk Hammond and J.E.B. Stuart himself were mortally wounded at the Battle of Yellow Tavern in May 1864. Dr. Hammond returned home after the war to find that both the North and South had repeatedly occupied his house, using it as an officers’ headquarters and field hospital. He was financially ruined and had to sell the estate, including its gristmill. Local legend adds that, while the Hammond men were away, the women of the family became snipers and killed several Union officers. They were captured and locked in the slaves’ quarters on the property. An officer ordered his soldiers to “get rid of the women,” by which he meant to transport them out of the area to a prison camp, but the order was tragically misinterpreted: the men are said to have set fire to the wooden shack, burning the trapped women alive. Although this story may well be apocryphal, there are abundant reports of ghost sightings at the Hammond House. This old gristmill was built in about 1790 by Robert Stephen (the brother of General Adam Stephen, who founded Martinsburg). Dr. Hammond bought the mill in 1839, along with a large distillery and other properties in the area. Stonewall Jackson’s troops camped at the mill grounds on their way to the Antietam campaign in 1862. Confederate General John McCausland’s infamous raid into Pennsylvania in July 1864, which resulted in the burning of Chambersburg, was initiated from the Hammond House. Although no fighting occurred in this immediate area during the Civil War, there are nonetheless many reports of strange lights and sounds eminating from the second and third stories of the old gristmill. As shown in this photo of the mill’s interior, that’s doubly interesting since the floors of the mill no longer exist! Wikipedia incorrectly identifies this old brick ruin as the Moses Nadenbousch House—but it’s not. However, I was so intrigued by the deteriorating beauty of this place that I wanted to track it down. It took some doing, but I finally found it along Butler’s Chapel Road south of Hedgesville. I know nothing about it, other than (i) it would make a great haunted house, and (ii) it’s been a ruin for a long time—check out the tree growing out of the ground-floor window. While the Fall Colors in this part of West Virginia weren’t quite up to the standard I’d found in Pennsylvania, they were still pretty impressive. And the plethora of haunted houses more than made up for it. This old duplex must have been built using a popular design, since there are many others just like it in West Virginia (with the likely exception of the Confederate flag in the window). I stopped at this old “BethOline Sinclair” service station to fill up, but there were no attendants or mechanics on duty. Must’ve been a holiday. As best I can tell, BethOline was a special blend of benzene-infused gasoline marketed by Sherwood Brothers, Inc. in Virginia, West Virginia, Pennsylvania, Delaware, and Maryland during 1946-1964. It promised higher octane and quicker winter starts. Benzene was later determined to be highly carcinogenic, and its use in producing gasoline is strictly regulated in most countries. One of the brothers, John W. Sherwood (1871-1965), is much better known for having created Sherwood Gardens and its extraordinary display of tulips in the Guilford section of Baltimore. This forlorn, burned-out house sits alongside Route 9 as it approaches Berkeley Springs, WV. On the other side of Berkeley Springs is the famous Potomac River overlook, with the village of Great Cacapon in the distance. It is well known that George Washington loved this view, and he bought a considerable amount of property on the West Virginia (left) side of the river. Back then, of course, it was part of Virginia. It was great fun to thrash the ever-willing 335i around the back roads of Pennsylvania and West Virginia in search of magnificent Fall Colors and haunted houses. The weather was perfect, the car enjoyed leaping from corner to corner—okay, I did too—and there was no shortage of interesting historical places to see. Other than dodging the John Deere combine, I enjoyed every minute of it. So what’s around the corner from where you live? I bet it’s equally scenic and interesting, and I recommend that you find out—and let us know the results!